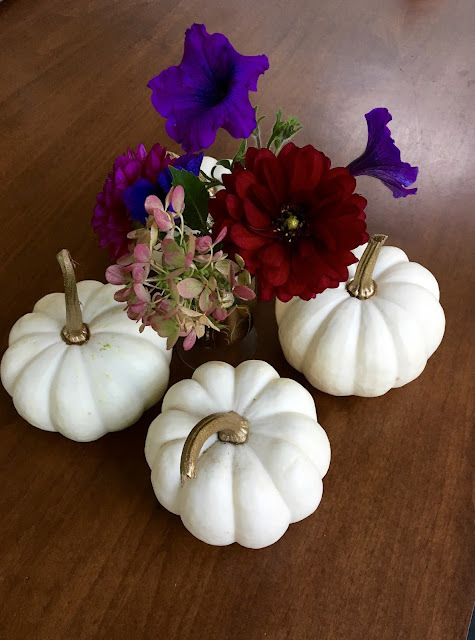 At a recent October gathering in the countryside, I decided to serve an array of fall-centric bites. The mild weather allowed for guests of all ages to relax on the deck and take in the foliage. Along with some local cider and brews, I arranged an assortment of plates including a pecan and maple topped baked brie with sliced apples, sweet potato and kale flatbread, and of course, a pumpkin-shaped pimento cheese mold. To add to the vibrant setting, I baked some autumnal-toned root vegetables. Using my mandolin, I sliced an array of potatoes and beets, sprinkled them with sea salt, a drizzle of EVOO, and baked them until crispy. 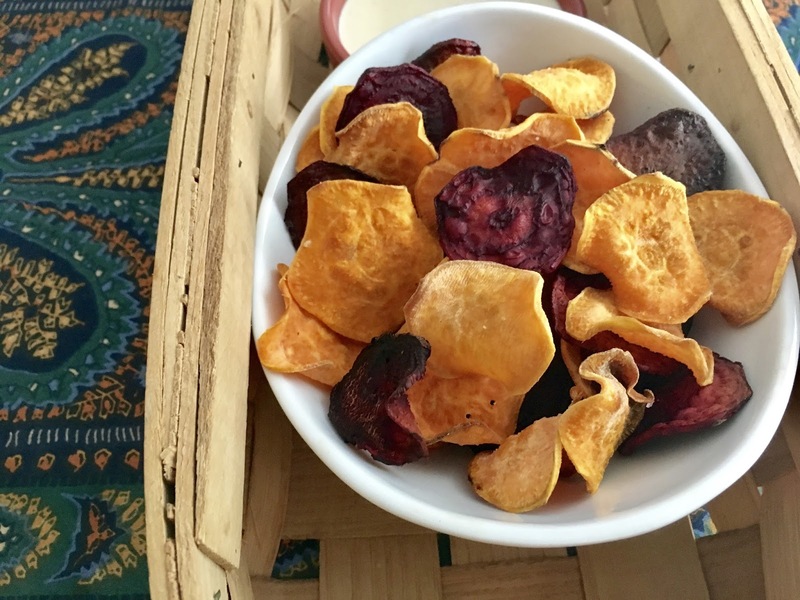 The raw slices transformed into these wonderfully sweet, ruffled chips. For a necessary dipping sauce, I decided to whip up a nostalgic blue cheese dressing. Growing up, I always topped salads with blue cheese dressing while Marni covered hers in French. While we fortunately outgrew this phase, I still enjoy blue cheese as a tangy dipping sauce with sweet and salty bites. The light and colorful chips alongside the rich dip were a big hit - best enjoyed warm from the oven! In a small bowl, stir together the Blue Cheese Dip ingredients and refrigerate for at least 30 minutes before serving. Preheat oven to 375 degrees Fahrenheit. Using a mandoline or sharp knife, slice the veggies 1/8-inch thick. Arrange the sliced veggies on a paper towel and sprinkle with sea salt. Let the veggies set for 10 minutes and then flip over, blotting with the paper towel to dry out. Line 2 baking sheets with parchment paper and spray with cooking spray. Place the slices in a single layer on the baking sheets. Spray cooking spray over the top. If you have leftover slices, set them aside until the chips are cooked and repeat the process. Bake until the veggie slices are crisp, about 25-30 minutes, turning about halfway through. Remove the baking sheets from the oven and let the chips rest for 5 minutes. Transfer the chips to a bowl and toss with salt. Continue to bake the remaining steps following the step above. Serve with the Blue Cheese Dip. Makes 5-6 cup of chips. 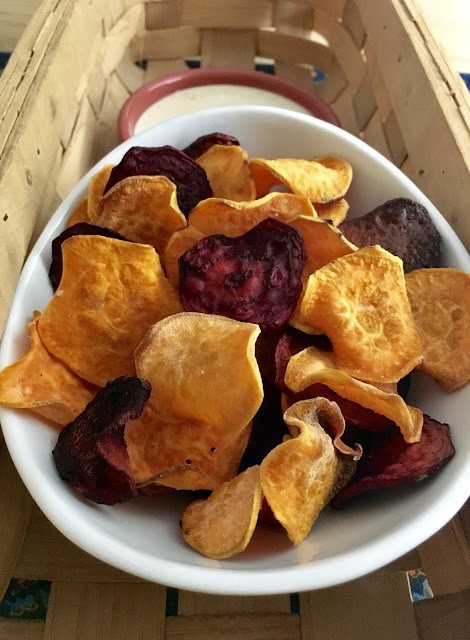 Whether it be a gathering around the fire, or during a football game, these chips are an easy snack, best enjoyed warm and crispy out of the oven. I look forward to incorporating parsnips, rutabaga or another root veggie into the mix next party!